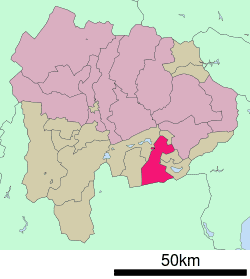 Fujiyoshida (富士吉田市, Fujiyoshida-shi) is a city located in Yamanashi Prefecture, Japan. The city was founded on March 20, 1951. As of February 2016, the city had an estimated population of 50,426 and a population density of 414 persons per km2. The total area was 121.74 square kilometres (47.00 sq mi). 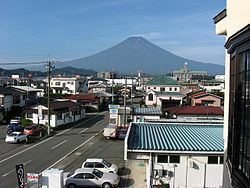 Fujiyoshida lies at the base of Mount Fuji, and is built upon old lava flows. It is considered a high-elevation city in Japan, at 2,140 to 2,800 feet above sea level. The city is also located between two of the Fuji Five Lakes. For several centuries, artisans around the Fujiyoshida area have produced high quality textiles, and now the city is the center of commerce and high technology in southern Yamanashi Prefecture. Fujiyoshida has seven elementary schools, six public and one private middle school, and three public and one private high school. Kitaguchi Hongū Fuji Sengen Jinja, a Shinto shrine dedicated to the kami of Mount Fuji, the Kitaguchi Hongū Fuji Sengen Jinja is the historical starting point for pilgrims climbing the mountain. The main structure was originally built in 788 and underwent reconstruction in the 17th century. Additional buildings include a shrine dedicated to Takeda Shingen (1521–1573), and a red torii which is taken down and rebuilt every "Fuji Year" (60 years). The shrine has a local history museum which displays items from Fujiyoshida's past including household items, farm implements, clothing and samples of the cities' famous textiles. Fuji-Q Highland an amusement park with a variety of attractions suitable for adults and children. Mt. Fuji Visitors Center. It is home to interactive displays, videos, books and guides about Mount Fuji. Mt. Fuji Radar Dome Museum. A tribute to the meteorologists who built a radar research facility at the summit of Mt. Fuji, which features a room which simulates the conditions at the summit of the mountain. Chureito Pagoda, built on a hilltop facing Mt. Fuji.